I enjoy giving hand-made gifts for holidays. This recipe is useful, looks pretty, smells good and doesn’t break the bank. It’s a good ‘little something’ gift. It’s a snap to make. This recipe makes a pint, but you can use smaller mason jars or decorative, wide-mouth jars if you wish to give smaller amounts. I’m not the type that thinks gifts must be themed for the holiday it’s being given in. For example, not every food-based gift at Christmas will be peppermint. You can make a peppermint scrub, but since the oil is yellow you would need to add red food coloring to make it look right. I don’t want to put food coloring on my skin, so I stick to scents that will match the yellow color. That’s why I choose citrus for gift giving. I enjoy using this scrub at home. I use it on my feet and elbows. It’s great for when your hands are beat up from gardening or crafting. And because I snuck in some epsom salts, you can also get a magnesium boost in addition to softening your skin. I keep some organic white cane sugar on hand because hubby prefers his kefir lemonade made with sugar instead of rapadura due to the molasses aftertaste. Since the probiotic bacteria consume most of the sugar in the lemonade and I can add Concentrace to replace the trace minerals not in white sugar, I’m good with that. As I mentioned in the salt dough ornament recipe, I keep iodized salt on hand for cleaning and crafts. I don’t worry about either in this scrub, because they get rinsed away after a brief scrubbing. Use an oil that you would be willing to eat because the oil stays behind on your skin when the salt and sugar are washed away. I used a fruity extra-virgin olive oil because that’s what I had on hand so it took more essential oil to cover it. If you use a skin-care oil such as almond or jojoba or a blend, it would require less. I don’t recommend straight jojoba oil due to its green color, it wouldn’t match the citrus smell as well. If you are giving to a person who is older or has delicate or thin skin, you might want to place the sugar and epsom salt into a blender and pulse it until the sugar particles are smaller. I pulse it about ten times. Place the sugar and both salts into a bowl. Add the oil and whisk until combined. Then add the essential oils until the smell of the oil is covered. For my strongly scented EVOO, it took about 35 drops. 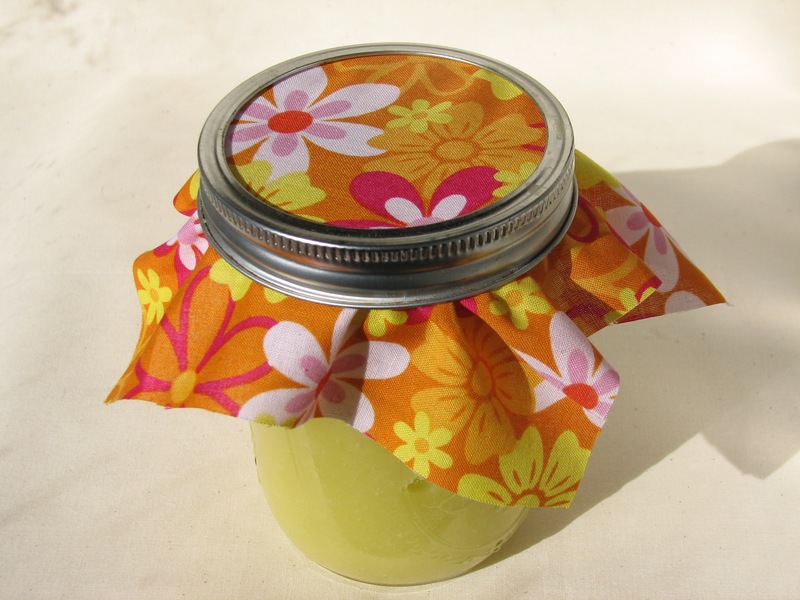 Transfer the mixture to your mason or decorative jar and shake to help remove air bubbles. Place the lid on top then cover with the fabric square. Screw on the ring to hold the fabric and lid in place. To use: This scrub is not for delicate skin. It is best used on thicker skin areas of the body, such as elbows and feet and things like dirty hands after gardening or crafting. If you’re gentle, it can be used on arms and legs, but it’s far too rough for the face and neck. Using a spoon, remove a small amount from the jar. Apply to wet skin. Scrub in circular motions and rinse thoroughly. 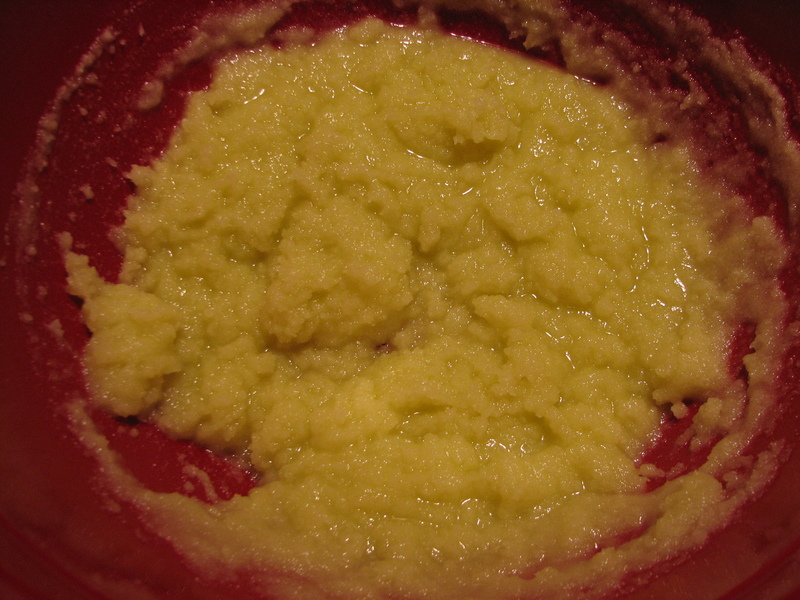 This is the texture your finished scrub should have. do you need to keep it in the freedge how long? tHE FACT THAT WHITE SUGAR IS REFINE ISN’T A ISSUE FOR THE SKIN? I don’t refrigerate it, I’ve never had a batch go bad. I go through one batch is about a month alone, or a couple of weeks if other family members use it. White sugar isn’t an issue on the skin. Your skin can’t absorb it because the molecules are too big. You rinse it off after you use it. Red food coloring is really easy to get naturally. Cut a red beet, cover with water in a pot, and simmer for 1 hour. Strain the water out and a couple drops of that water will dye food pink. 10 drops will dye food red.